William Penn Adair “Will” Rogers (1879 -1935) was a Cherokee cowboy, vaudeville performer, humorist, newspaper columnist, social commentator, and stage and motion picture actor. He earned fame as an American media star during the 1920s and 1930s. Will Rogers tragically died in a plane crash in Point Barrow, Alaska in 1935. 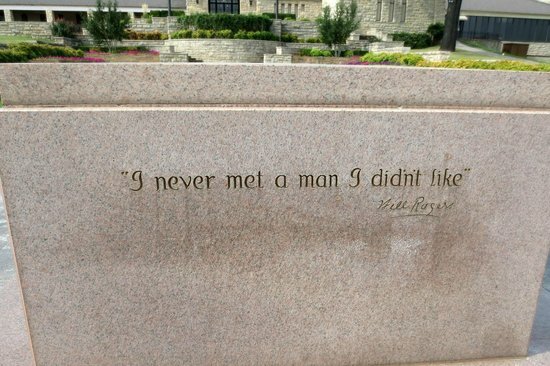 A funny guy, Roger’s wit followed him to his gravestone. He quipped during one interview, “When I die, my epitaph, or whatever you call those signs on gravestones, is going to read: I joked about every prominent man of my time, but I never met a man I didn’t like. I am so proud of that, I can hardly wait to die so it can be carved.” And so it was. I wonder how Rogers would spin our present day political debacle. Would Rogers like the Donald, Hilary, Jeb, or the rest of the cast? I’m already tired of the 2016 Presidential race and we’ve hardly begun. Already its Trump versus CNN, Trump versus Fox, Trump versus Bush, Republicans versus Trump, Trump versus Trump, Republicans versus Democrats, Reps versus Reps, Dems versus Dems, Liberals versus Conservatives…its maddening. As for Trump’s circus act, at least he develops interest so I suppose that’s a plus. I’m registered as “decline to state” but have voted across the aisle for both Democrats and Republicans. I’ll give any man or woman a shot at office if I believe they’re genuine and can do the job. 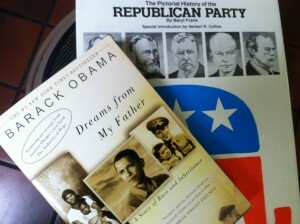 And if I like them I’ll vote for them again…but not for more than two terms (unless the competition is weak or wacko). Two terms in politics are plenty. I disavow long-term politicos who succumb to group think and/or dogma. Hire new blood. A guy racing yaks has more appeal to me than a career politician. At least the yak racer is moving. Our local library sells used books as part of its fundraising campaign and I found these two titles interesting: “The Pictorial History of the Republican Party,” and “Dreams from My Father,” by Barack Obama. The selling price was half a buck each. They remained on the rack for several weeks before finally vanishing. Or maybe the library just gave them away. I don’t care who people vote for and I’m reluctant to endorse candidates. Vote for who you want. All I ask is that you just keep wanting to vote. Feel free to visit my main Etc. Guy site and join my Facebook page by LIKING it. This entry was posted in The Humor Project, Words of wisdom and tagged 2016 election, Chico Enterprise Record, donald trump, eric miller freelance writer, etcguy eric, etcguy facebook, forrest gump, hockey player magazine, norcal blogs, will rogers. Bookmark the permalink. Got to your site on a referral. Thanks for posting! Hey! I should say thank you foг the post. I really enjoyed tҺis post. Been surfing the net and haven’t found articles like yours. Good content. I get what you mean. Nice blog. Been reading your posts, definitely worth remembering. Will visit again.